Sub avocado for most of the oil for a boost of ‘good fat’ and fiber. Why add mashed avocado to muffins? 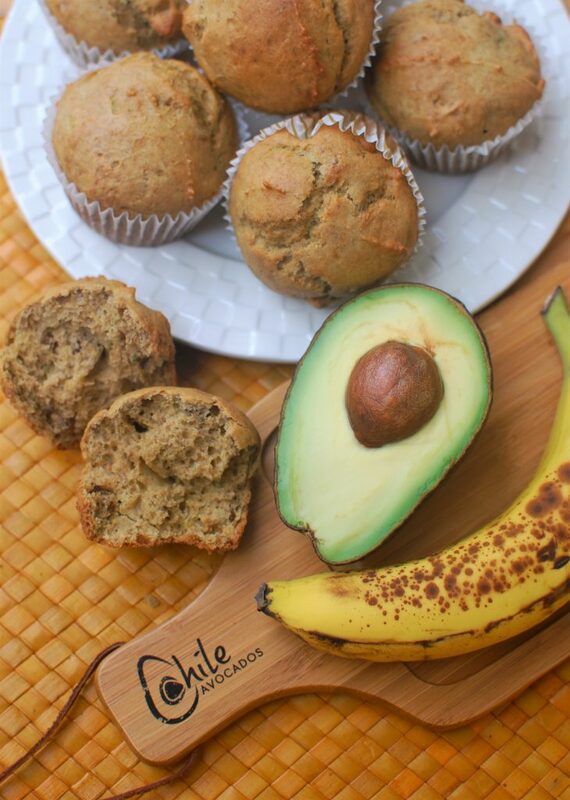 Because avocados are full of polyunsaturated fat (‘good fat’), are a good source of fiber (about 9 grams per avocado), are high in minerals and phytonutrients like Vitamin E, C, folate, magnesium, AND can replace other fat in baking as in this Avocado Banana Muffin. This was the first time I used avocado to reduce oil or butter in baking, though I like raisins and dates to reduce fat and sugar in Low-Fat Raisin Cookies, Cocoa-Coconut Cake, and Date-Apple Muffins. So I was intrigued with this muffin recipe from Avocados from Chile. What did I think of the muffins and could I taste avocado? Avocados are so mild and buttery there was no discernible flavor over the banana and cinnamon. I’d make them again. But next time reduce the flour 1/4 cup, or use a little more avocado — yes really. They weren’t quite moist enough for me, though I confess it’s maybe because I used part whole wheat flour. (I tend to modify recipes!). Let me know what you think when you try it! – 50 Million pounds/week shipped from Mexico to the U.S.
Preheat the oven to 350˚F. Grease 12 muffin cups or line with papers. Halve, pit and scoop out the flesh of the avocado. If there’s more than a gently rounded half cup, reserve the remainder for another use, or eat immediately. Whisk together the avocado, banana, sugar, eggs, oil and vanilla a medium bowl. In a large bowl, whisk together the flour, baking powder, baking soda, cinnamon and salt. Pour the avocado mixture into the dry ingredients and stir until just combined. Stir in walnuts or reserve and sprinkle on top of batter. Scoop into prepared muffin cups. Bake 20-25 minutes or until tops spring back when lightly touched. Remove from pan to cool. 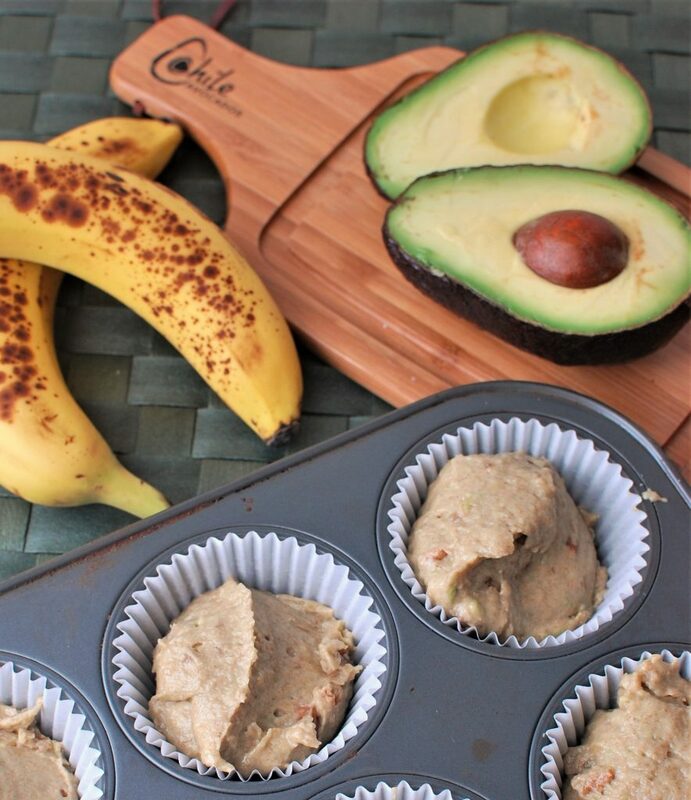 Avocado substitutes for some of the fat in the recipe - avocados are high in heart-healthy monounsaturated fats. There will be little flecks of green avocado in the batter, that's ok! The batter isn’t green, but little flecks of avocado may show. That’s fine! It’s kind of funny–years ago when I had my cafe, I was regularly substituting applesauce for fat in recipes to make them “healthier” and now we’re substituting one fat for another for the same reason. Did you notice any texture difference using a solid-at-room temperature fat versus oil–or did the avocado substitute for butter? Good question Jill and thanks for asking. I would say the avocado makes a texture more like a butter substitute than oil. But banana muffins don’t need much added fat so it’s a good combination with banana. And you’re right, apple sauce was the go-to fat replacer, prunes too and I’ve found dates and raisins do well too! I’ve been meaning to try this substitute for the longest time. I’ll have to tinker a bit since we’re at 7000+ feet now, but I love to bake, so it will be a very fun experiment. I’ll definitely back out the flour you recommend since I’ll be using whole wheat too, but will need to go further. I also often add yogurt to baked goods for extra moisture up here. I was all set to make banana bread, and now I know which one I’ll make. Thanks! How was IFBC? hi Susan! I’d love to know how you re-work the recipe for high altitude. IFBC was terrific. Inspiring and interesting people, new and helpful information for using social media. I particularly liked the keynote speaker https://cropmobster.com/ An example of using social media for social good.